Let me start out with an apology, for I have lost my Acheinu 3 booklet, and it is nowhere to be found! I have looked far, I have looked near, but I could not find the lost booklet! So, because of this, I’m going to have to review this by ear! Oh, Shapiro Brothers! You have put out your third album! My how your covers have advanced with the times. You started out with your first album, full of anivus; just a simple blue cover with your names, the title of your album, and claiming your yichus with your last name “Shapiro” on it. Then, just like the rest of the Jewish music world did, you became a little more “shpitzy.” You added, what I assume is a picture of the five of you, decked in matching ties; very elegant! Now you have gone above and beyond the call with your latest cover! A picture of the holy land, with a title added on the bottom! “V’shavu Vonim,” your very first title. I would like to be the first to publicly admit that you, Acheinu, have class! I’m not sure who made this latest cover, but it’s a thing of beauty. Anyway, down to business! This is the way it has worked in the past for me with Acheinu as a group. I have never enjoyed their cd’s off the bat, however, they do grow on me with age, like a bottle of fine wine. My feeling is that they have good voices, but they don’t have any voices that make you say “Oh, it’s that guys voice again, I love that guy!” However, in no way am I intending this as an insult. I feel that when they sing together, it is a thing of beauty! Their harmonies are music to my ears. (insert pun here). So yes, I am guilty, I don’t enjoy most of their songs until the second time around the song, where all the harmonies are thrown in. V’zocher: Once I hear the opening music, I was like “yup, they’re back!” This song reminds me of Ki Lo and Ki Shemesh, the opening tracks to their first two albums. Okay skip the beginning to the electric guitar in the middle; very nice! The classic Acheinu harmonies break in and it brings back memories of good times! Got to love the Na na’s as usual. Great song! definitely what I expected and then some. Al Hakol: The lyrics are beautiful; a very good choice for the music. Skip to the middle! I love hearing them singing together, it’s so hartzig! The Acapella piece at approximately 4:23 in the song glorifies the song really making it whole. V’Shavu Vonim: Ok, what? I feel like I have just been transported to a bar playing jazz. This is the title track, it needs to be solid, let’s find out… skipping to the middle. Okay, not a fan of the low part, I feel like it’s missing something; almost like it’s missing it’s essence. Well how about the chorus? Eh, I hear. Nothing to go crazy over, but not bad. The music itself I am not a fan of; I feel like they abused the horn instruments. Could be it’s just me, but it’s my review. =D. For one of the songs to finish off the album, I understand. However, the fact that this is the title track and in my opinion is not of the “finest” quality, sorry, not doing it for me. Ba Shabbos:	Come Shabbos! Something we are all familiar with I’m sure. The music is very tranquil, making it very befitting for the lyrics, and I mean tranquil in a sweet way, not in a “turn this off” type of way. The na na’s behind the the low part the second time around (approx: 2:46) are gorgeous; classic Acheinu, and that’s why I love them! The low part itself is as sweet as eating an ice cream sundae after spending three hours building a bookcase. (Yes, I know, I need power tools!) The chorus with harmonies added, are very plesant. I have one bone to pick with this song; it should be around a minute shorter! Otherwise, it’s a gorgeous song! One thumb up, only because I smashed my other thumb while building that bookcase. Al Chomosayich: Hehe, they are saying “shomri-i-eem,” nice shtick. Don’t miss the cool “Bop, badadadup” harmony at approximately 1:15. Am I weird? Because for some reason I think Baruch Levine when I hear the musical arrangements. (I need that booklet!). Anyway, the low part is very cool, and the chorus is top quality! Great song! K’Shoshana: Wow! Amazing song! However for me, it’s only great once Dovid Gabay takes over! I love the way he sings this song, it’s perfect for him. When Acheinu accompanies Gabay with harmonies, it brings this song to a whole new level. At approximately 4:34 in the song, Gabay goes up a key. DO NOT MISS THIS PART! (I bet you won’t) =D. Wonderful song; brilliant idea to bring Gabay into the mix. Geloibt: Nooooo! Let the people who have the accent handle the Yiddish folks! It’s a very nice song… for maybe, Yisroel Werdyger? Lipa? Take your pick. I’m sorry my Shapiro brothers, I can’t support this one. But loyal fans, don’t count this song out because I don’t like it! Listen for yourselves! Who knows, maybe there are people who like different things than me. Crazy idea huh? Hasem Shima: A typical slow song; nothing much jumps out at me. Listen for the “da da dee dum” at approximately 2:55, very soothing. The music is elegant, but I don’t find anything special about this song. Hinei:	A very relaxing fast song. Acheinu comes alive with their harmonies at approximately 2:11 in the song. This song can be classified as simple; very easy to sing along with. Yehi Shalom: Do yourself a favor and skip until approximately 3:04 in the song for the “Acheinu effect.” This is the tenth song on the album and you can tell it’s wearing thin. It’s by no means a bad composition, it’s just not a song you’re going to remember. At 4:53 in the song the electric guitar comes in; very EG Productions style. I’m personally not a fan of electric guitar solos in the middle of a slow song, so it ruins the song for me. Acheinu: This is the Shapiro brothers first English song, and whaddya know, it’s called Acheinu. This song is showing many different types of sects of Yidden, and how we can each be doing our own thing, yet at the same time, be united as brothers (Acheinu) through our prayers. With all the catastrophic events that are occurring in the world, these lyrics are a gift upon my ears. The actual song sounds like they stuffed the lyrics together, however, only a little bit. It’s a very nice song to close out with, especially the piece at 6:10, where the acapella is gorgeous. The final verdict:	The only reason I bought this CD after hearing a preview on it, which was not so great, is because I knew it took me a while to appreciate the first two as well, so I figured it would grow on me. Nothing doing for me so far, but maybe down the line I will appreciate it more. Should you buy it? I can’t make that decision for you, however, I will say that if you listen to the preview and you’re not impressed, it’s because they don’t have that “Sweet!” factor to them. If you have the money, give it a try, you may be pleasantly surprised. Visit me: Check out my blog at jmderech.blogspot.com. 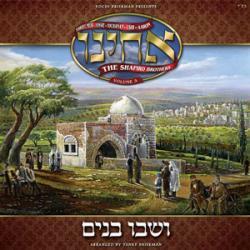 You will find a few other reviews and some random posts on the Jewish music world. Hope to see you there!